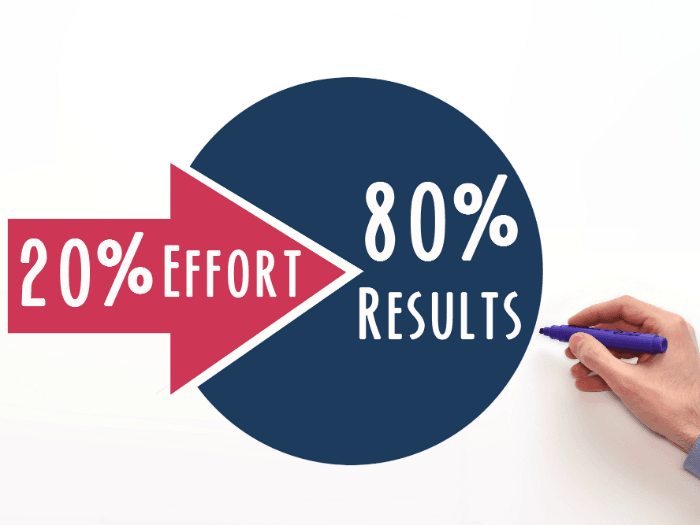 The Pareto Principle (80-to-20 rule), named after Vilfredo Pareto, states that 80% of the results are achieved with 20% of the total effort. The remaining 20% of the results require 80% of the most work. How you can make use of this principle, you will learn here. Although Pareto studied land ownership in Italy at that time and found that 20% of the people own 80% of the country, this principle is also effective in the world of work and the achievement of goals. In essence, it says that 80% of tasks can be done with only 20% of resources. So that with only 20% use 80% of the problems are eliminated. What about the Pareto Principle today? These days, the principle is often used in project /time management. It can be used to identify important work packages that significantly advance the project or work packages that, due to lack of efficiency, contribute less to achieving the results. 20% of the customers provide 80% of the turnover, 20% of the products provide 80% of the turnover or even 20% of the effort make 80% of the success! How can you use the Pareto principle for you? Concentrate on the things you always do on the 20% of the actions that bring you the greatest success. For this, it is important to recognize or identify the activities that provide 80% of the result or the success. You should always do these activities first. In doing so, also recognize the activities that are superfluous and hardly or only marginally contribute to the desired result. Things that should not bring in anything you should leave out then of course. With this procedure, you can gain more time for the important things in life! You should also know the Pareto principle in the Pareto principle! For very large tasks or even very long tasks or projects you should know: There is also a Pareto principle in Pareto principle. Also for the 20% of the work with which you reach 80% of the success, the Pareto Principle applies. You can also get 80% of this 20% from this 20% with 20% of the bet! And does that help you in everyday life? What should you pay attention to at Pareto? You can often use the Pareto principle to optimize and set priorities. But you can not apply it to all life situations. Especially the mathematicians among you will rightly say that in certain situations the ratio can be 10 to 90, 30 to 70 or even 20 to 90. Sometimes just 80% of the result is not enough and the framework conditions require you to go much further (example software development). But the parenting principle is often a good tool in the job, in your projects and quite a tool for more free time. It can give you time and sharpen your gaze for the essentials.